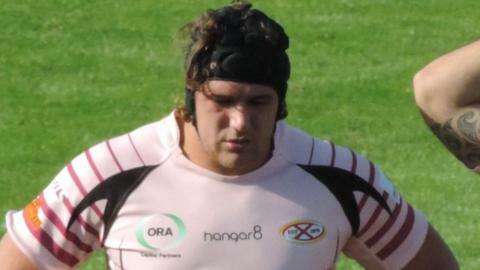 Exeter have signed Jersey prop Harry Williams on a two-year contract. Williams, who was once part of the Wasps academy, has played 17 games for Jersey this season having moved to St Peter from Nottingham last summer on a two-year contract. "What we've seen is a big, strong guy who scrummages really well," Exeter boss Rob Baxter told BBC Sport. "When we had him in and tested him, he came across very well in the interview and his physical testing showed he's a very powerful guy. "There are elements of his game he has to work on, as any player has to in the Premiership or the Championship, and I think overall the package is there to make a very good Premiership forward." Williams's fellow props Tomas Francis,Alex Brown and Carl Rimmer have all joined Exeter from Championship clubs in recent years. And Baxter says a grounding in the second tier of English rugby can improve the character of players. "It's not a smooth path for them just playing at school, being picked up by an academy, staying at one club all the way through to the first team and playing a bit of A League rugby and everything's nice and happy," he said. "They've had to show some different character to progress themselves in different ways and stay within rugby as a sport and I find that a very strong quality."